Dr. Shamsi provides care with efficiency and professionalism, an eye to what the patient is going through and the best wayto alleviate the issues whilst maintain patient comfort. Dr. Shamsi is a no-nonsense straightforward doctor that seems to have mastered his specialty. Will be scheduling futureappointments with him, and highly recommend him to anyone in need of a good doctor in the area. Dr. Shamsi is a no-nonsense straightforward doctor that seems to have mastered his specialty. Will be scheduling future appointments with him, and highly recommend him to anyonein need of a good doctor in the area. 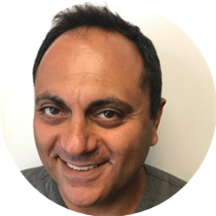 Dr. Shamsi is a native of Santa Monica, California and is board certified by the American Board of Internal Medicine in the subspecialty of Gastroenterology. He is an attending physician at Cedars Sinai Medical Center and other local hospitals in Los Angeles. His practice is focused on clinical medicine and he performs a variety of diagnostic and therapeutic endoscopic procedures. One of the best!!! Always listens and considers your input as well. Total one on one experience like this, very rare to find these days. Visited Dr. Shamsi based on others reviews. I completely agree and, although there was a rare minor issue that happened, Dr. Shamsi made sure I was all right before releasing me and called me directly to follow-up the same night. He is caring, thoughtful and very professional. Dr. Samshi took great care in listening and finding all the information to provide treatment. The office staff is also very nice and professional. He's seen it all and is very knowledgable. And funny. He makes your visit as un awkward as possible. And the nurses are fun too. So happy I was referred to Dr. Shamsi. Staff is friendly and helpful. Dr. Shamsi explains everything clearly, listens to the patient's concerns, and is also a very nice person. Dr. Shamsi is attentive, funny, and informative. His office staff are friendly, professional, and very helpful. Very positive experience! Dr. Shamsi is awesome! Wonderful bedside manner, definitely keeps a normally awkward/uncomfortable experience as light-hearted and relaxing as possible. He is very thorough, patient, and asks many times along the way if you have any questionsor concerns, and if you understood what he was saying. Dr. Shamsi is very skilled in his profession, very knowledgeable and trustworthy. He is actually the first doctor recommended by ZocDoc who I feel is exceptional in his arena and for whom I actually took the time to write a review for, and he and his wonderful staff definitely deserve it. I'll definitely continue my GI visits here. Thanks, Dr. Shamsi! I really enjoyed my time with the doctor. However, my appointment was at 1pm and the door to the office was locked until two receptionists arrived carrying a bunch of food around 1:25pm. I sat on the floor outside for nearly40 minutes and they seemed clueless to why I was even there. When I finally said, Hi, I had an appointment at 1? One receptionist said "uhh yeahhhhh, we had to pick up food". No apology, explanation. Very, very odd. I told the Doctor and he seemed very concerned and as if he was going to take action. I will still be seeing him again, it was just a really bad first experience. Parking was also expensive, cash only. Took his time. Gave me great information and feedback. Took the time to discuss my particular insurance, and how that would affect the procedures being discussed. Very knowledgeable on the medical and the insurance/cost info. Not lookingfor my doctor to be my friend, but I am looking for a straight talker with a human side. Dr. Shamsi was all that. Very thorough and showed complete interest in my concerns and needs. He made me feel very comfortable about what is regarded as an uncomfortable procedure. I was very happy to be see this Dr. He is able to engage and communicate with you. He makes every effort to understand your issues and deal with you accordingly. He has a sense of humor and a warm manner.He doesn't seem a little 'shady' like a number of Dr's I've had to visit recently. He was clear and spoke with me openly with no sign of the usual patronization you get from Dr's and was genuinely interested in helping me solve my issues. It was a very productive encounter for me, in spite of the fact that my issues are really not in his specialty. His staff are really excellent; efficient and helpful and they anticipate the Dr's requests. They are happy to answer any questions you might have. Dr Shamsi performed my Colonoscopy. I felt very confident in this Dr's approach and abilities. Dr. Shamsi was fantastic - he spent a full hour with me (never happens with specialists!) going through my symptoms, history, treatment plan and exam, making sure I fully understood and was completely comfortable. Couldn't be more happy with his service. Dr. Shamsi was very helpful, professional and thorough when he was asking me questions. He made sure I was referred/connected to the appropriate people. The people in his office were courteous, as well.